Attorney General Matt Denn along with the attorneys general of 48 states and the District of Columbia Tuesday announced a settlement with Colorado-based The Western Union Company (“Western Union”) to resolve a multistate investigation focused on complaints of consumers who used Western Union’s wire transfer service to send money to third parties involved in schemes to defraud consumers. Criminal scams that involve wiring money include: lottery and contest scams in which consumers are told they have won a large sum of money but must first wire money to pay required taxes or fees before receiving their winnings; “grandparent scams” in which a consumer believes his or her loved one is in immediate danger and needs money right away; and romance scams in which someone poses as a love interest and then soon begins asking consumers to send money for various reasons, such as medical emergencies, car accidents, muggings, and emergency travel. • Prompt and appropriate disciplinary action against Western Union agents who fail to follow required protocols concerning anti-fraud measures. 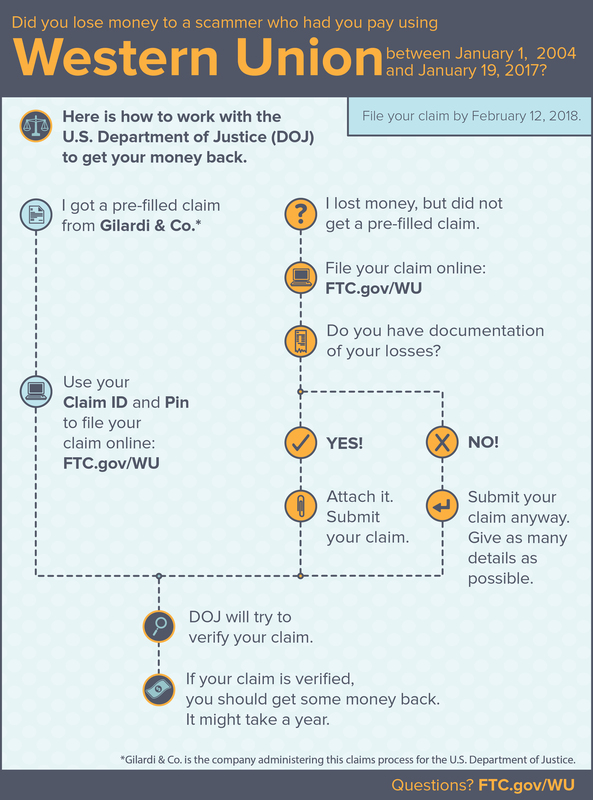 Victims of fraud induced wire transfers nationwide, including Delaware victims, will receive refunds as part of a settlement between Western Union and the Federal Trade Commission and U.S. Department of Justice that was announced on January 19, 2017. In that settlement, Western Union will pay $586 million to a fund that the U.S. Department of Justice will administer to provide refunds to consumers. In the settlement with the states announced Tuesday, Western Union will pay a total of $5 million to be split among the states for the states’ costs and fees associated with the investigations that led to the settlements, with Delaware receiving $43,630 for the state Consumer Protection Fund. Delaware Department of Justice Consumer Protection Director and Deputy Attorney General Christian Wright worked on the investigation for Delaware. Information about the federal settlement is available at here, and information about the victim compensation process will be made available here.